The Apollo 11 landing site is located on the southwestern edge of Mare Tranquilitatis. The AMIE camera onboard SMART-1 imaged the region on 5 February 2006 from an altitude of 1764 km. The resolution of the image is 159 m per pixel - too small to reveal details from the Apollo 11 landing. The image is centred at 23.9° E, 1.7°N. 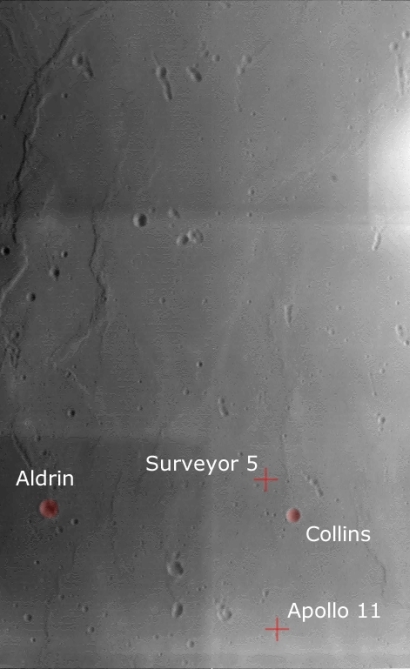 As well as the Apollo 11 landing site, the image area also includes the landing site of the Surveyor 5 probe (a US probe that landed on 11 September 1967), and two of three craters named after the Apollo 11 crew. The third crater, Armstrong, is to the east of the image. Other significant features in the surrounding area are crater Lamont to the north, crater Moltke to the south and craters Sabine and Ritter to the west. The area is, in general, featureless. As part of a lunar Mare this region consists primarily of basaltic lava. The lava flow is a relatively young event the occurred after the main period of crater formation. Because of this the area met all the topographical conditions for a lunar landing: a relatively smooth surface, no large hills or craters in the area, a gentle slope of less than 2°.